Are you interested in saving big while keeping your car in great condition? Then consider the benefits of becoming a rewards club member! You will find all the information you’ll need below. Rewards Club members accumulate one (1) Club Point for every dollar spent on valid car wash, auto detail and quick lube purchase & ten (10) Club Points on a gasoline fill-up*. Track your purchases automatically from your license plate or by your Unlimited Plan number. 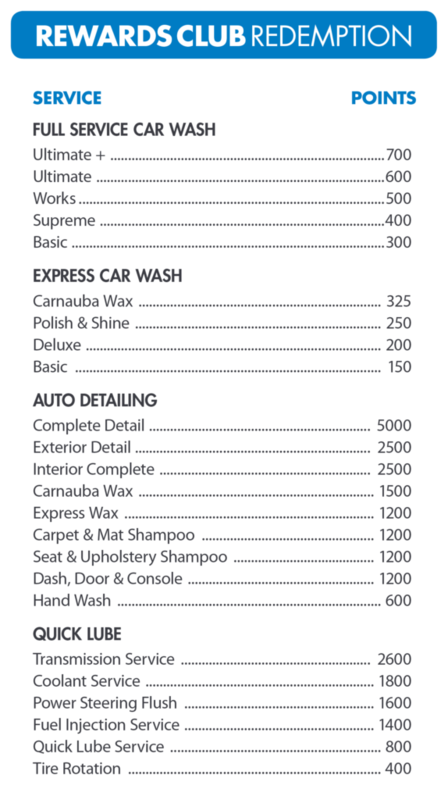 Redeem your Club Points for FREE car washes, auto detailing or quick lube services (gasoline excluded). Receive a FREE Basic full service car wash on your birthday as our special thanks! (Valid from one day before to one day after your birth date). We will deposit 150 FREE Club Points into your account upon valid Rewards Club enrollment with valid email. You’ve already earned your first FREE express car wash! Bring your car back within 48 hours of original purchase, rain or shine (with your receipt and Rewards Club card) and receive a FREE Express Drive Thru car wash (exterior service only). Receive special discounts and offers exclusively for our Rewards Club members (all personal information is protected and never sold or shared). Receive confirmation of your Club Points balance at the bottom of every receipt, conveniently have your Rewards Club card scanned at any facility to confirm your balance, or request the information on-line. Please keep your Rewards Club brochure in your vehicle glove box to reference program features and benefits. *Maximum one gasoline fill-up per day (two per week) on regular retail customer vehicle, no fleet or commercial use vehicles. Rewards Club members accumulate one (1) Club Point for every dollar spent on valid car wash, auto detail and quick lube purchases & ten (10) Club Points on a gasoline fill-up at any participating Cobblestone Auto Spa location. A gasoline fill-up is ten (10) gallons or more. Maximum of 1 gas fill-up per day, 2 per week, personal vehicle only; no fleet or commercial use vehicles qualify. Club Points will accrue in the cardholder account every time it is used and may be redeemed for free car wash, detail or quick lube services. Club Points cannot be redeemed for gasoline. Member must present valid Rewards Club card and proper ID to redeem Club Points for free services. For members to receive Club Points on purchases, either the Rewards Club card must be presented to cashier at time of transaction, or the vehicle license plate must be properly recorded on the pre-receipt. It is the member’s responsibility to ensure their license & points are correct at time of transaction; adjustments cannot be made later. Cobblestone Auto Spa cannot be responsible for lost, stolen, misused or missing cards. Such cards may be replaced for a $5.00 service charge, at which time member Club Points will be restored onto a replacement card as solely determined by Cobblestone based upon their computer records and the old account will be canceled. Members agree not to allow others to use their Rewards Club card and that to do so constitutes fraud and will result in membership termination without any compensation for accumulated Club Points. Members may have up to two vehicles serviced under their membership and accrue Club Points for dollars spent on those two vehicles only. Club Points from different accounts may not be combined into either a single account, nor combined for redemption or other purposes. Rewards Club program and offers subject to change without notice, including services that are available for redemption and the amount of Club Points required for such redemptions. Cobblestone may terminate their Rewards Club program at any time, without prior notice, with or without compensation for accrued Club Points. Not valid with any other discount or offers. Members are not eligible for Club Points when using other non-Rewards Club discounts. Employees and/or their family members are not eligible to participate. By signing up for and joining the Rewards Club, member agrees to the Terms and Conditions stated herein, posted at each location, or available on the website.